Very clean, all-natural Colombian Emerald done in a classic Emerald design. All-natural Brazilian Emerald in a classic Emerald design. Natural Aquamarine in a classic Emerald design. Rich Green / dichroic Epidote from Afghanistan faceted in a classic Emerald design. Deep Chrome diopside in a standard emerald cut. This stone is a dark, rich color that nearly hides the flaw at one end. Very pretty all-natural Colombian stone. You don't often find Emerald in a Princess design - This one is waiting for the special person to love it! 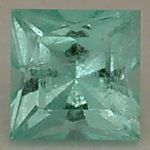 Fine, clean, Aquamarine from Pakistan in a long "pencil-style" cut (like a stretched Emerald), this stone catches the eye, and is waiting to become the centerpiece of your pendant! This gem was finished with my Voodoo Polish. Untreated green Beryl from Columbia. All-natural Colombian stone - light color. This is the rarest of garnets. Emerald wishes it was this color. This stone displays desirable horsetail inclusions under a 20-x loupe. This is the rarest of garnets. Emerald wishes it was this color. This stone was custom cut in an original design and displays desirable horsetail inclusions under a 20-x loupe. All-natural Columbian stone with better than average clarity and good geometry. Beautiful Juniper Ridge Opal in a 14k gold setting with a 19-point diamond. Huge 15mm long Fire Opal, great for a real eye-catching pendant! This is a very large and saturated Sunstone that shows flashes of different colors, a hint of Schiller, and a tendency to change colors with different light sources. Small, light-colored Green Beryl from Africa. This stone has the flaws and inclusions typical of this material.